It's funny how things work out. In 1922, visionary German director F.W. Murnau made the first great vampire movie in Nosferatu, but ran foul of Bram Stoker's estate when they brought a successful law suit for copyright infringement against the filmmakers, who had 'freely adapted Stoker's seminal Dracula without consent from author or publisher. With the production company now in liquidation, the judge made the unusual decision to order all copies of the film destroyed, leaving the way clear for Universal Studios in the US to make the vampire movie that was to define the genre for decades to come. So it seems only just that five years later Murnau should be invited to Hollywood by William Fox to make Sunrise: A Song of Two Humans and that it should go on to win three Oscars at the first ever Academy Awards ceremony in 1929. That he should do so, that he was able to do so, without compromising his style and vision is perhaps a testament to times past. If anything, Murnau appears to have thrived in the Hollywood of that time (a golden moment for the director there that was sadly not to last), and with Sunrise made one of the most emotionally overpowering, visually striking and beautifully realised works not just of his career, but of the whole silent era. If you don't want to know the film's story in detail, you might want to skip the rest of this paragraph and the first part of the next one. But if you're game then bear with me, as there is reasoning behind my plot spoiling. It goes like this. An unnamed man lives on a farm with his wife and young child. Once upon a time they were very much in love with each other and with life, but more recently things between them have turned sour. The man has become involved with a Woman From the City, who wants him to sell the farm and come live with her. In order free himself from his family, she suggests that he kill his wife, to push her into the lake and pass it off as a boating accident. Initially horrified at this suggestion, his lust for the woman eventually prompts him to attempt the deed, but at the last minute his wife's pleading prompts him realise the terrible mistake he is about to make. He frantically rows the boat to the far shore, where his wife runs away and boards a tram to the city, anxiously pursued by her desperately apologetic husband. As he tries to make amends, the two of them observe a young couple entering a church to marry, prompting the them to recall their own once strong feelings for each other, and they emerge from the church ready to rediscover their love for one another. All of which probably sounds like solid but largely familiar stuff, a melodrama of love tested by adversity in which everything works out well in the end. There is even triumphant, climactic church-bell driven music as they walk down the steps like besotted newlyweds, announcing to the audience that everything has worked out after all. But before those of you who chose to ignore my warning complain that I've given away the whole plot, you should know that when the couple emerge from the church we are not at the film's end, but only a little over a third of the way in. Astonishingly, much of what follows is devoted to the couple's rediscovery of their love and each other, showcasing a complete reversal of the usual narrative structure in which characters are introduced and relationships defined and then disrupted by plot development. Here the plot comes first and later takes a back seat to character development, only re-emerging towards the end to provide a climactic scene that ties up loose ends and gives the film a solid dramatic finale, one that is packed to the brim with thematic and even ironic connections to earlier story details. If this challenge to conventional narrative structuring makes Sunrise seem as fresh today as it ever did, then you ain't seen nothing yet. Few films in the history of cinema, silent or otherwise, have achieved such an extraordinary level of visual and dramatic poetry, or demonstrated so vividly the possibilities of cinema as a means of emotional and artistic expression. This is evident right from from the opening scene, as a drawing dissolves to a wide shot of a city railway station (actually a mixture of models, real people, forced perspective sets and paintings), which gives way to two dynamic superimpositions that in a matter of seconds suggest the pace, industrialisation and even glamour of (then) modern city life. In a time of MTV visuals and post-production manipulation possibilities, it is genuinely thrilling to look back almost eighty years and see what might now be passed off as visual trickery used with such an extraordinary sense of purpose. This is rarely better demonstrated that in the scene in which multiple images of the Woman From the City are superimposed over the Man she has an emotional hold over, all the more remarkable in that they were done not in post, but in camera (this sort of post-production technology had not yet been developed). 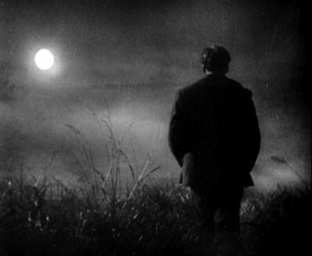 Murnau throughout tells the story in almost exclusively visual terms, his use of complex tracking shots, carefully chosen camera angles, expressionist sets and lighting and even performance providing us not just with detailed plot and character information, but the emotional states, thoughts and intentions of the two protagonists. Occasional intra-titles provide clarity on dialogue, though even these have sometimes expressionist overtones, the line "Couldn't she get…drowned?" crumbling away as if into the water that the film then cuts to for a flash-forward to the dark deed under discussion. If anything, the passing of time and an increasingly formulaic approach to scene coverage and editing have enhanced the boldness of Sunrise's technical handling. Shots are held for sometimes mesmerising length (the tram trip to the city focusses on the actors but has insanely complex background detail, all constructed manually on the Fox backlot), while others, notably the vision of urban hgh-life conjured by the Woman from the City, have a visual dynamism and energy that recalls the frantic imagery of Vertov's Man With a Movie Camera. 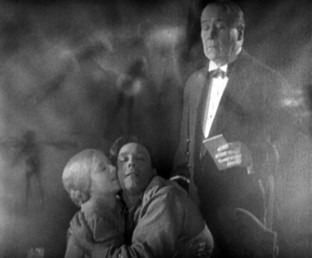 Every shot is composed to perfection, the framing, lighting and superimposition work of Charles Rosher and Karl Struss as layered with meaning and subtext as they are visually striking, especially when juxtaposed through Murnau's effective use of cross-cutting, flashback and dark visions of possible future events. Even the performances have expressionist overtones, most notably in the Man's murderous approach to his wife, in which his posture and movements most vividly recall Paul Wegener's Golem, a hulking stone figure driven to murderous intent by love. Technical dazzle aside, Sunrise delivers most effectively as an emotional entertainment, engaging us with the plight, torment and ultimately joy of its central characters in a way that really fires up what would nowadays certainly be passed off dismissively as a Hollywood ending. The sinister gloom of the first third gives way to a charged exuberance, reflecting the return of energy and love to the central relationship. It's also peppered with comical set-pieces, sometimes involving secondary characters: the frantic search for the head of a small statue that was never present in the first place; the camp prissiness of the barber; the fairground games that result in the chasing of a drunken pig and its celebrated recapture; the falling shoulder strap that is repeatedly returned to its correct position (a gag taken here to its on-screen limit and an inevitable punch-line). In essence this midsection becomes a celebration not just of love but of life itself. That the reconciliation takes place in the very location that spawned the initial temptation is one of many examples of the multiple levels on which so much of the film works. Sunrise really is magnificent cinema, a gorgeous creation that is as startling and original now as it ever was, in part because of the arrival of synchronised sound and the end of an era in which stories were told in such visual terms. That we still have such a film to remind us how far the early pioneers took a medium whose evolution appears to be slowing to a crawl is to be enthusiastically celebrated. OK, the film was released in 1927, and yes there are dusts spots and scratches and occasionally some more serious damage and the image flickers throughout, but in all other respects this is a terrific transfer, with the contrast, black levels and (given the age) detail all superb, and damage when it does appear has been cleaned up so effectively that you only really notice it on areas of one shade. The picture framed at its original aspect ratio of 1.20:1, which will display small black bars on the sides on a 4:3 TV. There are two music tracks on offer, the original mono Movietone score and a newer stereo score by Timothy Brock and performed by the Olympic Chamber Orchestra. 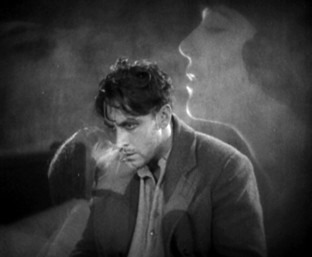 Brock's score wisely takes many of its cues from the Movietone score and works well for the film, but I have to express a preference for the original – the sinister rhythmic notes in the first third, the slightly less obvious use of sound effects when the couple cause a traffic jam with a passionate kiss, even the use of silence over the opening titles. Both sound good, and given its age the original score is in very impressive shape. This, it should be noted, is a re-issue of Eureka's first Masters of Cinema title, a two-disc release that has been repackaged on a single DVD, in the process losing a couple of its original extra features. There is a commentary by cinematographer John Bailey, who has DoP'd sixty films including American Gigolo, Cat People and Mishima: A Life in Four Chapters for Paul Schrader, as well as such notables as Silverado, A Brief History of Time and Groundhog Day. Given the sizeable amount that has already been written about the film's meanings and layering and stylistics, it is refreshing that Bailey focuses primarily on the cinematography, his own area of specialisation and one of the film's Academy Award-winning components. It's a consistently fascinating listen, revealing a great deal about the complex construction of images within the film, including sets that I was certain had to be locations and the use of forced perspective and midgets to create a false but convincing sense of scale. The trailer (1:50) is in surprisingly good shape and is made up of brief shots from the film intercut with positive press quotes. There is no music score on this. A selection of outtakes (9:15) can be viewed either with intra-titles outlining the sequence to follow or with a John Bailey commentary. Bailey makes several references to the outtakes in the main commentary and this is effectively an extension of that. Frankly I was surprised these even existed, and they're not in that bad shape considering their age and the unlikelihood of their survival. As you'd expect, they are a valuable inclusion. Murnau's 4 Devils: Traces of a Lost Film (39:59) attempts to reconstruct Murnau's lost 1928 film 4 Devils through the use of posters, programmes, production sketches, script extracts, blueprints of sets and publicity stills, all rather dryly voiced over. It does rather make you water for the film itself. There are also a three DVD-ROM features in the shape of the Screenplays for both Sunrise and 4 Devils in Microsoft Word format and the Original Photoplay Script, complete with hand-written annotations, in PDF format. I particularly applaud this, as this enables you to scale the text to your preferred size, and is thus accessible to the sight impaired. Finally there is the expected 40-page Booklet which is of the usual excellent Eureka standard, and includes detailed notes of the restoration of the film by David Pierce, comprehensive essays on the film by R. Dixon Smith (2004), Lotte H. Eisner (1964), Robin Wood (1998) and Lucy Fischer (1998). All make for fascinating reading. The term classic is thrown about with such abandon these days that it's lost all meaning, usually applied to films just a few years old that have yet to stand the test of time or be widely appraised and evaluated – the term 'instant classic' in particular is an oxymoronic one. Sunrise: A Song of Two Humans is genuine classic cinema in every sense of the word, a towering work that has proved enormously influential, been extensively and intricately written about and, most importantly, has stood the test of time magnificently. Eureka's re-release showcases the film wonderfully, with a terrific transfer, two soundtrack options, a fine technical commentary and some very nice extras. This one deserves a place on the shelf of everyone who truly loves cinema.